Compared to other decoration materials, the environmental protection coefficient of stone is quite high, unlike other furniture and decorative materials may contain formaldehyde and other harmful substances. Marble - with elegant appearance, high gloss and enjoy extraordinary reputation for being at home can use the window-stone, parquet floor molding, dining tables, coffee table, window panels, counter tops, walls, etc. image. Culture stone - bright color and rich texture, you can add natural living room a natural feel, generally for Chinese and American Pastoral retro style for landscape decoration. 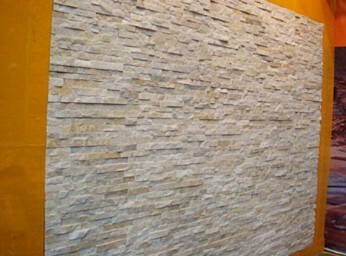 Sandstone - a modest structure with the flexibility to change designs and sizes, and more at home used to do TV backdrop and the image of the wall. However, the porous sandstone, soft material, so they need time to time for chemical treatment to avoid staining.